Eat Cake Today is the No.1 Cake Delivery Shop in Kuala Lumpur, PJ and Selangor, Malaysia. Get fresh online birthday cake delivery now in just 4 hours! Along with indulgent desserts, you can also receive added benefits during deals and promotion offers. This may include certain add-ons or even a discounted price on your favourite treat. To ensure you don’t miss out on any exciting Eat Cake Today promotion or Eat Cake Today promo voucher, be sure to sign up for their newsletter. 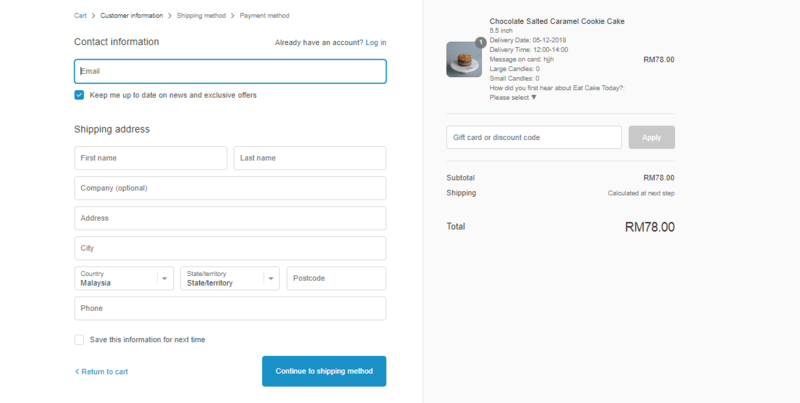 Customers ordering their favourite dessert from Eat Cake Today in Malaysia can enjoy several additional discounts and benefits when they buy via ShopBack along with additional cashback. In addition, you can also follow the brand on Facebook, Instagram and/or their blog for the latest updates and cake additions. Some similar services in Malaysia are Delivereat and Foodpanda. Eat Cake Today is a platform that allows cake lovers and seekers in Malaysia to explore for cakes for their birthday parties, celebrations and even corporate events. Eat Cake Today Malaysia allows overseas customers to purchase cakes for their family, relatives or friends who live in Malaysia on their special days. All you need to do is just to place your order through Eat Cake Today and the recipients will receive it as a big surprise from a thousand miles away. Eat Cake Today also creates opportunities for home bakers and cafes to outshine and sell their products through Eat Cake Today's website. The team members work together as partners and bring surprises and happiness to people all over Malaysia. Got a last minute birthday party to throw? Have a sudden desire to wallow in a deliciously decadent cake? Forgot your wedding anniversary, partners, mothers, or even your boss' birthday? Don't fret, Eat Cake Today Malaysia is here to ensure that you don't have to worry about these things anymore. Shop for café quality cakes from your favourite baker and the team will have it delivered within a swift delivery time of just 4 hours. The company was founded by three girls with a fondness of sugar—Crystal Tan, Elaine Yuen, and Sue Lyen, in August 2015. Realising how common it was for people to run around last-minute for a cake, the girls decided to make things easier with a delivery system. With just 4 hours as a minimum required time for a lot of cakes, Eat Cake Today allows you to make your loved one’s day special even at the last-minute. Today, Eat Cake Today is the No.1 Cake Delivery Shop in Kuala Lumpur, PJ and Selangor, Malaysia. Their range of 400+ premium cakes (including designer and customized) from local bakers cater perfectly for your next corporate/office bulk order, wedding and kids events. Note: All listed bakers use halal ingredients and operate from a pork free environment unless clearly stated otherwise. For those in a rush or looking for something specific, the site also allows you to sort the cakes based on minimum processing time. Café quality cake selections on the website are categorized by minimum processing time requirements, such as 4 hours, great for last minute parties or urgent occasions where you need a gourmet cake to impress! You can always order upfront from any of the lists, and have it delivered on the same day or arranged for future delivery dates, as long as it's within the minimum processing time! make your loved ones day even more special. Here, one can combine the cake with balloons and monograms for a truly exciting celebration. In addition, an Eat Cake Today promo code will ensure that you don’t have to spend much while ensuring a gourmet celebration. When it comes to someone's birthday, anniversary, bridal shower or any special occasions, Eat Cake Today is here to customize your cake just the way you like it. Eat Cake Today provides delivery for your customization cakes within Kuala Lumpur and other places. Please note that the team requires at least 4 working days of notice to ensure smooth ordering. Indulging in your favourite dessert has never been easier. Simply follow the steps outlined below to order your favourite cake and have it delivered fresh at your doorstep. Step 1: Choose the cake you like from the homepage and click on it to read additional information about the flavour profile. You can also search for a specific flavour by using the search tab. Step 2: You can read the description as well as any reviews to know how your peers liked the flavour. If you want any add-ons such as candles or other details, you can select from the options given. 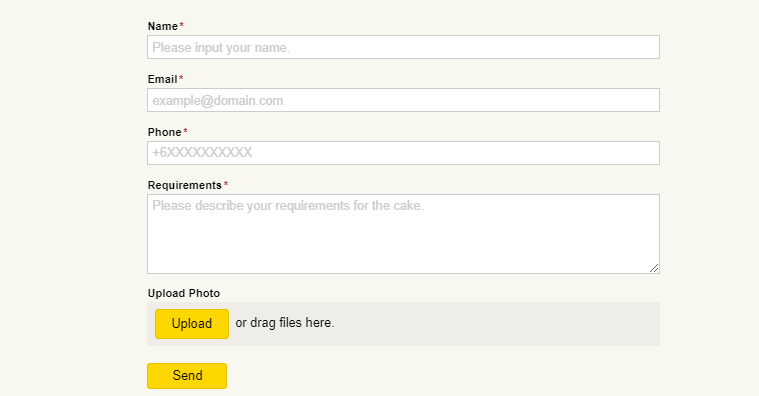 Step 3: Next you will have to provide details regarding timing, delivery date, cake size, message etc. When everything is in order, click on ‘Add to Cart’. If you would like to order more cakes, simply add them to cart as well. When done, click on the cart icon at the top-right corner and click on ‘Checkout’. Step 4: Here you will be able to see your order summary and total. In case you have an Eat Cake Today discount code or Eat Cake Today promo code, be sure to enter it in the box given and click on ‘Apply’ to receive your discount. Step 5: Enter your account, billing and delivery details followed by your delivery and payment. Once your payment is processed, Eat Cake Today will confirm your order with an order confirmation email. This will include details of your preferred payment method via Online payment, Credit Cards or Paypal and details of your selected delivery time slot as an confirming details of your order. Please make sure to check the Spam or Junk Folder in your e‐mail if you have not received the order confirmation. Step 1: Visit the ShopBack website and click on the Eat Cake Today link at the bottom of the homepage. You can also use the search box to find the link to the store. Step 3: Look for the latest Eat Cake Today promo code or Eat Cake Today discount code in the Eat Cake Today coupon code, discount code and promo code section. 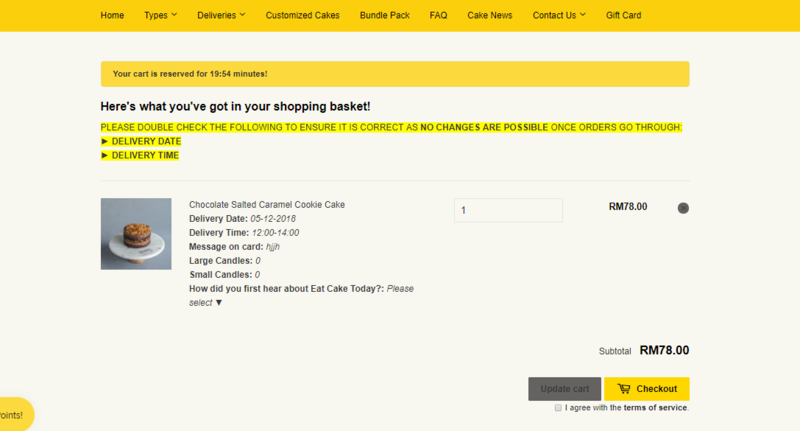 Step 4: You will be redirected to the Eat Cake Today website to browse and select the items. Eat Cake Today currently only delivers to all areas in Klang Valley and Selangor in Malaysia. The target is to cover the most of Malaysia from time to time so new places may be added routinely. Eat Cake Today enhances your experience with 4 hours deliveries. Please note that to be able to receive your cakes on the day itself, order must be placed by 2 pm. However, the site also takes advance orders up to 1 month in advance of the scheduled date of delivery. 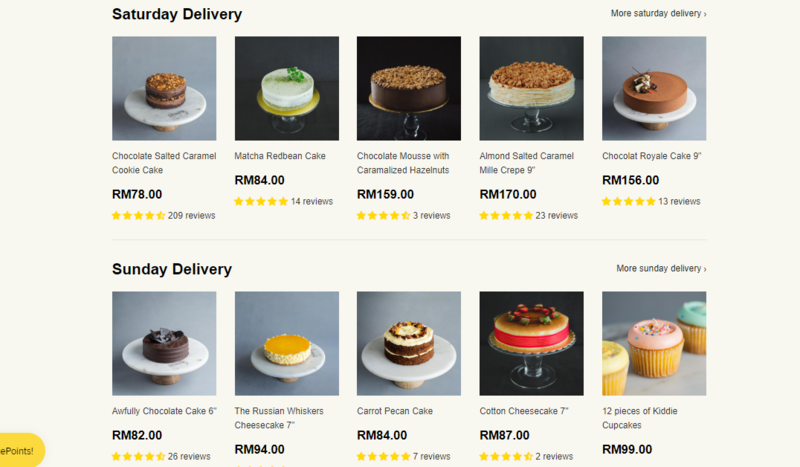 The delivery charges for an order typically starts from RM10 and can go up to RM40. Should delivery be attempted to the specified shipping address and no one happens to be present at the time of delivery nor respond to the calls or messages, an additional fee of RM30 will be charged for re-delivery. A photograph of the cake with the recipient may also be snapped at the point of delivery drop-off to ensure that the person in file who has received the cake (whether it is the customer or someone collecting on their behalf) is the intended recipient and that the cake is delivered in one whole piece. Please keep a look out of the lead time required to ready your cake order, it ranges from 4-hours to 3-days. If the order is meant to be a gift, please ensure that you are reachable by WhatsApp or Call or Email so that the support team is able to communicate with you, the sender. That way, the recipient can enjoy the surprise of the cake and does not need to deal with any queries our team may have for delivery. Please note that once your order has been processed, there is no turning back. Eat Cake Today does not allow for any changes or cancelations to the cake order. There are also no refund options allowed for your order. You can also earn cake points with various activities and redeem them on your cake order. However, you have to be a member to start receiving points so be sure to sign up if you have not yet done so. Shopping for someone else but not sure what to give them? Give them the gift of choice with an Eat Cake Today gift card. Simply visit the homepage and click on the ‘Gift Card’ tab. The card is available for RM100 and you can purchase multiple cards at a time. The Gift cards are delivered by email and contain instructions to redeem them at checkout. Note that these gift cards have no additional processing fees.